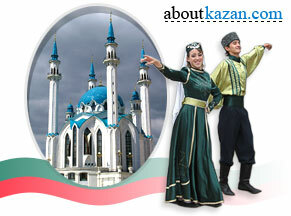 One of the most celebrated days in Kazan city is the Republic Day. It reflects both the old Russian and Tatar people customs and festivals and a new face of Kazan city. 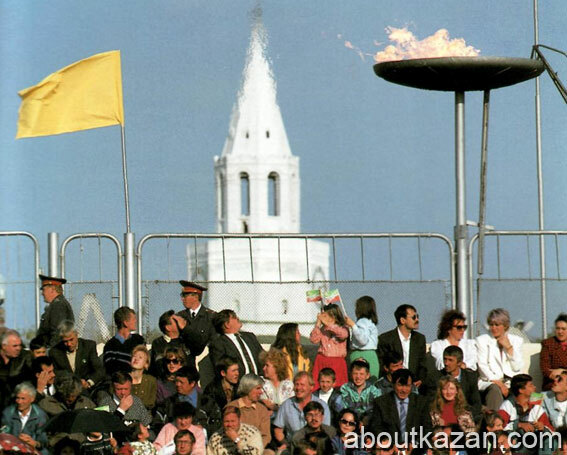 Crowds gather in the Kazan city stadium, located on the site of the old Tashayak Fair, to see the colorful spectacle: horse races, the national wrestling, the ingenious folk contests, such as the famous sabantuy, 'the celebration of the plough'. The crowds of Kazan city people that assemble to celebrate the Republic Day could be seen in earlier times only during the officially sanctioned manifestations organized for May Day and the anniversary of the October Revolution. But on the Republic Day the people who gather together whatever their ethnic origins, experience a new feeling of solidarity and common purpose. Besides Russians and Tatars, who are the most numerous, there are the Chuvash, Mari, Udmurt and Mordvin peoples and many others. Although in recent years there has been much emphasis on the renaissance of the Tatar nation and its culture. It should not be overlooked that, according to the statistics, every inhabitant of Kazan city is a partner in or comes from a mixed marriage Kazan has always been noted for the good relations among the people that make up its inhabitants. Despite all the national sporting events when, for example, on the ice of Lake Kaban the workmen of the Tatar settlement and the Sukonny quarter, located on opposite shore came out to try their strength in fist-fighting, the history of the few centuries has not known serious ethnically-based conflicts. Working together and sharing the burdens of life has always been common to the multi-national population. Strictly speaking, this comes at the beginning of summer, after the first hay-making but why not celebrate it again in August, at harvest time? The Tatar festivals mirror the people's adventurous spirit and their zeal for work. It should be mentioned that in the old days landowners along the Volga always tried to hire Tatar peasants for the harvest, not only because they were remarkable for their sobriety, but because they knew how to use two hands on the scythe. The Kazan city history says that prince Andrey Kurbsky who had distinguished himself during the capture of Kazan city, gave a rapturous description of the surrounding area. He said: "In that land there are big fields, exceptionally abundant and generous in their crops. There are also the beautiful courts of their princes and grandees, truly amazing. There are villages, and there is so much grain of all sorts that one cannot describe or believe it - it is as plentiful as the stars in the sky." The anonymous author of The History of Kazan city, who lived for a long time at the court of the khan, describes what he saw with similar wonder: "It is a beautiful place... rich in pasturage for herds, and rich for bees, bringing forth all types of grasses and abundant in fruit, full of wild animals, fish and all sorts of worldly goods; you cannot find another place like it for beauty and wealth in the whole of the Russian land, with such riches that I'm not sure any foreign lands have." The multi-national culture of Kazan city is displayed at the Republic Day festival in its full spectrum: there is the Kazan Theatre of Fashion, which is almost unique in the world, musical ensembles playing on traditional instruments, the dramatised history under the open sky. At such breathtaking spectacles, when the stadium becomes a theatre, it is very clear that the greatest riches of Kazan city are the people who live there.